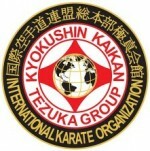 The International Kyokushin Kaikan Tezuka Group was founded by Kaicho Toru Tezuka. The head quarter is located in Chiba, Japan. After Sosai Mas Oyama passed away in 1994, Kyokushinkaikan was separated into several major groups. Tezuka group was established in year 2000 by Kaicho Toru Tezuka who was the only leader who carried true Japanese spirit and had the method to educate our younger generation to the right path. Today group is led by Nidai Kaicho Yoshimichi Mori from Sendai Japan.